BRCK Excursion: Mt. Suswa from WhiteAfrican on Vimeo. 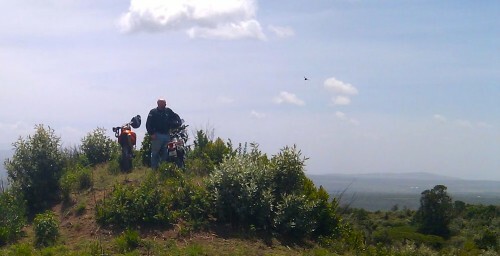 We took a day ride out past the Ngong Hills into the Rift Valley and up Mt. Suswa. Here’s a (very) short video where were playing with a DJI Phantom 1 and a GoPro to do some flyovers of the vehicles. We went with 4 motorcycles (2 KLR 650s, 1 Suzuki DR650, and a BMW 650GS Dakar), plus a Landrover Defender 90. A good grouping of bikes and a backup vehicle, and a day with some fun dirt riding. The rocky road up to the top of Mt. Suswa is a lot of fun, and I was glad there had been rain the day before in order to reduce the dust. The Masai live on Suswa, and though it looks bleak and unforgiving from down below, once you get to the top there is a lot of nice land for grazing and for growing crops. There’s also an extensive network of large lava caves. We explored through a few of them with our guide Jermiah (pictured below). For this picture, we’re standing in the “Baboon Parliament”, a huge entrance to a cave, with it’s own skylight. The baboons live above, and they congregate, play and have meetings in the area where we are standing. It smells horribly, as all of the beautiful colors on the rock are from baboon urine, and all of the dirt below is baboon crap. If you go further inside, there’s a bat colony. Here’s the BRCK sitting on the top rock in the baboon parliament’s cave. Today I had a lot of fun, one of my old schoolmates (Markus) from here in Kenya asked me if I wanted to get out of Nairobi and hit the trails on our motorcycles. Of course, the answer was yes. We headed out towards Naivasha early this morning and then took a side road off towards the escarpment. The roads are dirt and with the recent rains they’re really quite rugged and beyond most normal vehicles. 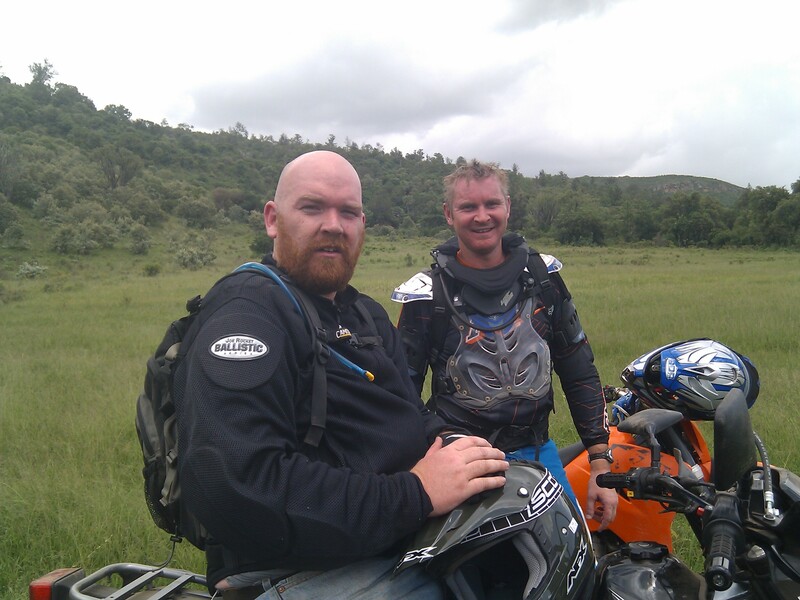 Markus is an experienced trail rider on a KTM 450 (kitted out), I’ve ridden a lot of trails, but years ago and not nearly as experienced as Markus – and I’m riding an offroad/onroad Suzuki DR 650 (stock). Bruises (and bruised ego) aside, we kept going up into small-farm, where quite a few more people live, and which is almost entirely denuded of trees that were there just 15 years ago. After talking to some of the local community, we were advised to head down a certain road, with assurances that it would lead us to the bottom of the escarpment. It did, eventually, but not until we had backtracked, sidetracked, followed animal trails (in buffalo country), and then realized that the washed out gully we were in was supposed to be the road. 3.5 hours of wrestling a mammoth 650cc bike through this terrain left me exhausted. This type of bike is not made for that level of technical riding down boulder strewn gully’s and game trails. 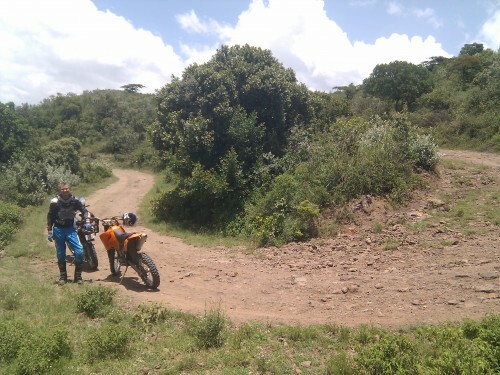 However, it was also hugely rewarding when we finally found our way to the bottom of the escarpment and much easier riding. I also brought my Android Nexus One along for the ride, hoping that the battery life would allow me to use it for tracking our trip. The Nexus One has a GPS, and there’s an Android app called My Tracks, that tracks your trip, allows you to add waypoints, then easily shares it to Google’s MyMaps. It doesn’t look very exciting like that, but it does give you the exact data for having your own challenging ride if you’re in Kenya. I had a couple free hours this afternoon and decide to take advantage of it. Bodaboda’s are motorcycle taxis in East Africa (getting their name from the original bicycle taxis near the border of Kenya and Uganda). I decided to ask a guy if I could rent his for the day. 500/= Kenya shillings later ($7), and I was on my towards the Nairobi game park, to a reserve where one of my old school teachers now lives. It didn’t go very fast, being 125cc and a cheap Chinese contraption, but that wouldn’t be advisable on these roads anyway. I got dusted a few times by a big lorry or bus, but was okay once I got beyond the main roads. There were quite a few animals around as I got closer to the reserve, nothing exciting, but fun none-the-less: giraffe, wildebeest, monkeys, ostrich and a bunch of Masai cows. Best part: cutting the bike off in the middle of nowhere and listening to the wind blow through the bush. 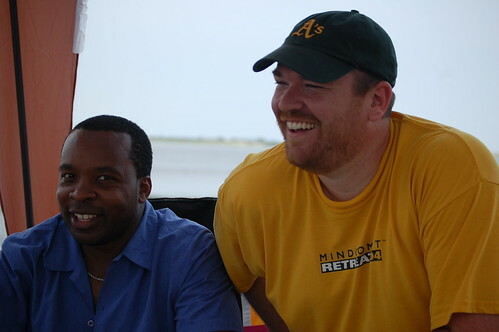 This is the Africa I miss. I had a great unplugged-from-the-grid long weekend, from which I finally got back from late last night. This morning I actually sat in front of my computer and, though I had a million things to say, couldn’t seem to get them down right on the blog. Thank God for lifelong friends.